Viewpoint Tickets - Best prices on Nationals tickets, Baseball tickets and MLB All Star tickets. Location: At the southwest corner of the intersection of F.D.R. Boulevard (Route 23) and Route 18. Dimensions: Left field: 315 ft.;center field: 399 ft.; right field: 313 ft. Known in Puerto Rico as "Estadio Hiram Bithorn", the ballpark was named for Hiram Bithorn, the first Puerto Rican to break into the major leagues (April 15, 1942 as a pitcher with the Chicago Cubs). Located next to Roberto Clemente Coliseum and across the street from Plaza las Americas, it is one of the largest baseball facilities in Puerto Rico. The Montreal Expos played twenty-two home games in Hiram Bithorn Stadium in each of the 2003 and 2004 regular seasons. 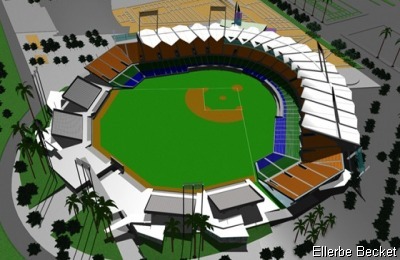 However, the stadium was built as, and continues to be, a Puerto Rico Professional Baseball League (LBPPR) ballpark. The acronym LBPPR actually stands for the Liga de Beisbol Profesional de Puerto Rico, a winter baseball league. In the years that the Expos played here, two LBPPR teams also called it home. The Santurce Cangrejeros (Crabbers) and the San Juan Senadores (Senators) each played here in the winter. The stadium has also hosted world championship boxing fights and important concerts. Retired numbers: Roberto Clemente (#21), Ruben Gomez (#22) and Orlando Cepeda (#30). Hosted the Opening and Closing Ceremonies of the VIIIth Pan American Games in 1979. Frequent host of the Caribbean Series. The Toronto Blue Jays and Texas Rangers played their season opener here on April 1, 2001. 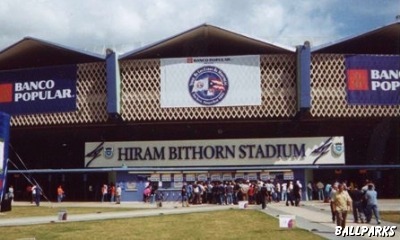 Exterior view of Hiram Bithorn Stadium courtesy of FieldTurf. Rendered aerial view of Hiram Bithorn Stadium courtesy of Ellerbe Becket. Special thanks to Saul Suarez. Tickets to NCAA Basketball Tournament, College Football Bowl, NCAA Football, Paul McCartney and Washington Nationals provided by Ticket Triangle.